Like many, I enjoy long distance train travel and, like many, look back in awe at Rhodes’ attempt at building a Cape to Cairo railway. Rhodes never completed his vision, but the, somewhat romantic, idea of being able to take the train from the Mediterranean, say Alexandria, to Cape Town, still fascinates many. I’ve somewhat traveled in Africa myself, including having taken some of the few remaining long distance train connections. Even though many of the train lines are in dire traits, it’s still an eventful and reasonably comfortable way to travel, when possible, and, on these long distances, certainly beats being holed up in a bus, with goats breathing down your neck, chickens stuck under your seat and bags of maize under your feet. However, mostly, the locals don’t seem to agree, and prefer cars or busses to the dilapidated train network of, particularly, sub Saharan Africa. Much of Africa’s train network was put in during colonial rule, which might in part explain the post-colonial powers’ lack of interest in maintaining the existing rail connections, to the extent where plenty of the existing lines were ripped out of the ground and sold, lock stock and barrel, as scrap. 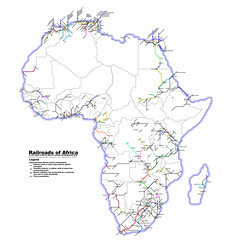 That said, the last decade or so has seen something of a revival for African train connections, though primarily as a means to ship natural resources out of Africa, the train lines typically paid for by multinationals or big spending foreign governments (think China) and designed to be used for goods transport, not people. I figured it would be interesting to map what’s left of Africa’s train network. To my surprise, traveling by train from Cape to Cairo is almost, theoretically, possible, the only real gap being the lack of tracks between the South Sudan town of Wau and the northern Ugandan towns of either Pakwach or Gulu, a distance by road of about 1000 kilometers. Besides this gap, tracks cover the whole distance from Alexandria to Cape Town (outside a ferry connection on Lake Nasser, or Lake Nubia, if you prefer the Sudanese name, between Aswan in Egypt and Wadi Haifa in Sudan). Sadly, several of the connections are for goods only, and plenty of the lines see rather infrequent connections for passenger transport. Still, not bad for a total distance of 7500 kilometers, as the crow flies, some 10500 kilometers by road. Also to my surprise, I found that there are quite a few more working rail lines than I expected, still in operation on the African continent. Sure, though South Africa’s passenger traffic appears to be slowly but surely dwindling, their network is still the most extensive in Africa. And Morocco has even been increasing its network over the last few years, introducing some high speed and very comfortable connections. But also Algeria has an extensive rail network, as, to some extent, does Nigeria. Still, the bulk of the network is in southern and south eastern Africa, with a reasonable to good connection between Dar es Salaam and Cape Town. South Africa (1, 2, 3, 4), Mozambique (1, 2, 3, 4, 5), Malawi (1, 2), Zimbabwe, Botswana, Namibia (1, 2, 3), TAZARA, connecting Zambia and Tanzania (1, 2, 3), Zambia (1, 2), Kenya (1, 2), defunct eastern Africa lines, Egypt (1, 2, 3, 4), Ethiopia, Eritrea (1, 2), Sudan (1, 2, 3), Tunisia (1, 2), Algeria, Morocco, Senegal and Mali (1, 2, 3), Angola, Camaroon, Burkina Faso and Ivory Coast (1, 2), Benin (1, 2), the Congos (1, 2, 3), Libya, Ghana, Guinea, Liberia, Madagascar, Mauritania, Swaziland, Nigeria, Sierra Leone, Togo. Here and there, I was able to draw on personal experience, but most of the map is drawn based on sources which can’t always have been up to date. I’d happily hear about and correct my mistakes. Post ideas, suggestions and corrections in the comments below.